Is there a physical explanation behind the derivation of spectroscopic term symbols? In deriving the spectroscopic term symbols, one method seems common among several sources, the clearest presentation for me being located here, a derivation of the term symbols for a $d^2$ ion. 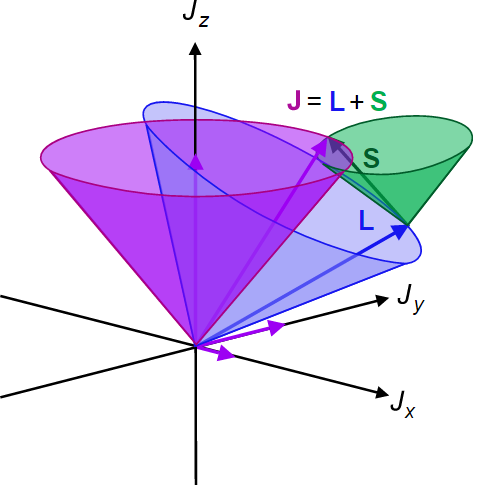 If I look at, for example, the wiki diagram for LS coupling by vector addition, I would assume S = 0 and L is equal to 1 in both of the above microstates. From the same vector addition diagram above, these top row microstates should be equivalent to the bottom row microstate cross-diagonal from it. As far as I have understood, the spectral term takes the absolute value of L and does not distinguish between -L and +L (eg. L=1 and L=-1 both yield P term symbols), so $|-L-S|=|L+S|$. Alternatively, I have also considered that maybe the absolute value is only taken on L and not S. In this case, $|-L|+S=|L|+S$. Then the microstates would not be equivalent cross-diagonally but instead horizontally (top row microstates equivalent to each other and bottom row microstates equivalent to each other). 3. Not all term symbols for the potential microstates are a solution. After the method was so thorough in including all the potential microstates, some of these microstates turn out to be nonexistent or physically not relevant. I am interested to know roughly why this method for the derivation of term symbols is physically logical (why it works), more specifically why the above states are not redundant, and most especially why certain spectroscopic terms / electron microstates are not relevant. I'm afraid the question may be too open ended, so if I can clarify any further, or there's a concise reference, please let me know. Browse other questions tagged physical-chemistry quantum-chemistry spectroscopy or ask your own question. How does one find the ground-state term symbol for a configuration that is exactly half-filled? Why is $^3P_1$ an atomic term symbol for carbon? Correlation Diagram Doesn't Match Selection Rules? Term symbols: counting electrons. How?